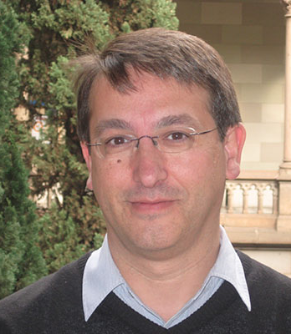 Dr. Jordi Vitrià is a senior researcher and full professor at UB. He received his Ph.D. degree from the Universitat Autònoma de Barcelona in 1990. Dr. Jordi Vitrià has more than 25 years of experience in working on Computer Vision and its applications to several fields. His research, when personal Computers had 128KB of memory, was originally oriented towards digital image analysis and how to extract quantitative information from them, but soon evolved towards computer vision problems. After a postdoctoral year at the University of California at Berkeley in 1993, he focused on Bayesian methods for computer vision methods. Now, he is the head of a research group working in object recognition, deep learning and image analytics. In 2007, he joined the Applied Mathematics and Analysis Department at the University of Barcelona (UB) as Full Professor, where he teaches an introductory course on Algorithms and advanced courses on Data Science and Big Data. From April 2011 He is serving as Head of the Applied Mathematics and Analysis Department, UB.